I met Meghan my first year at Camp Mishawaka. She was everything I wasn't. She was outgoing, I was shy. She was a "wild" child, I was the good kid. She knew all about fashion, I knew nothing (and still don't) about fashion. We were perfect for each other and within a couple days were the best of friends. That first year we were in the same cabin together. One of my favorite memories of Meghan is when we had a chipmunk living under the cabin. We found the hole he was coming in and out of and we decorated it. We took 2 toothpicks and made them flagpoles, complete with flags. Everyone else thought we were crazy, but we didn't care and continued to make things to decorate the chipmunks front door. When we left camp we wrote each other at least a couple of times a month. And every once in a while we were allowed to talk on the phone. Back then talking long distance on the phone was a huge thing. The next summer (85) we were not in the same cabin, but we continued to be best friends. I still remember getting off the bus that first day and seeing Meghan running when she saw me. That summer was probably one of my best summers of my life. When camp was over that year my Grandma (Dad's Mom) picked me up and I stayed with her a few days. I remember at the time I was upset because I really wanted to ride the bus back to Minneapolis with everyone else. That visit was the first time I had spent any time with my Grandma when it was just the two of us. She lived on a small lake in a tiny town called Outing. It had been a month since I had talked with my parents and when I tried to call the house it said the number was disconnected. I remember thinking that this was strange, but my Grandma reassured me that everything was OK. And when my parents did call later that night I was so excited to talk to them that I forgot to ask why the phone was not working. Three days later when I went home I found out why the phone was not working: my parents had moved while I was at camp. They had been thinking about moving, but I had no idea they did actually move. It was a shock to me. When my parents moved I had to switch school districts which meant instead of being in elementary school for one more year I was now in Middle School. That was another big shock to me. That fall I continued to write Meghan. We decided we needed to get together around Thanksgiving. Much to my surprise my parents allowed me to go see her and I spent 5 days with Meghan and her family over the Thanksgiving weekend. Meghan and her family lived in New Jersey and were just an hour from New York City. I was so excited about going to not only see Meghan, but get to see New York City. Her parents took us to the Macy's Parade and all I remember from that is the crowds. But hey, I can still say I have been to the Macy's Thanksgiving Parade. That next year when camp started Meghan was different. She seemed angry and not happy. She talked a little about the problems she was having with her parents and how they were arguing all the time. Within a couple of days she was getting into arguments with the counselors and really was doing whatever she wanted. About two weeks into the session Meghan was sent home. The day she left we were both bawling. That's one goodbye I will never forget. That Thanksgiving Meghan came to Kansas City and the following summer I went to visit her again. She never returned to camp, but we continued to be friends. Even though we were both changing, that change only seemed to make us closer. 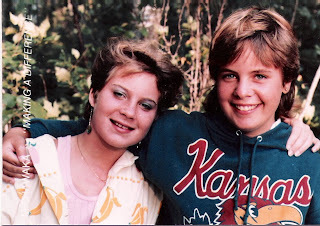 The summer of 87 was the last time I saw Meghan. After our visit that year we continued to write each other and talk on the phone, but once we were in high school our letters become fewer and fewer. Within a couple of years we had lost touch with each other. I thought of her often and wondered how she was doing, but for some reason never wrote her to tell her I was missing her. When my ex-husband and I moved in 1996 I found a my old address book with Meghan's address and phone number. I immediately tried to call her. Meghan's Mom answered and was so happy that I had called. She said Meghan was not living there, but she would give her the message I had called. Two days later Meghan called at 2AM. We only talked for about 30 minutes because I couldn't really understand what she was saying. She was talking in a loud whisper and was not making any sense. I never tried to call her again. I think of Meghan a lot. I wonder if she is married, if she has kids, where she works....if she is OK. I can't think of Camp Mishawaka without thinking of Meghan. Before meeting Meghan, I had never been around someone that was such a free spirit. I was so used to being told what to do and how to think that when I first met Meghan I was so fascinated with her. I loved how she didn't care what people thought about her and just did her own thing. Thinking about who I am today, I realize that Meghan was that first puzzle piece. Try to find her Caroline - do it! I loved this. So interesting, so engaging. I'd like to know where she is now!